Princeton Music Boosters started in 1961 where among other things, it was decided to award two scholarships in order for students to attend private music lessons. We currently award 25 scholarships ranging in value from $500-$750 each. While it is not required to attend private music lessons at Princeton, many of our students desire to do so knowing the impact that lessons have on their musical ability. Countless studies have proven the positive effects that music and the performing arts have on children, including increased cognitive abilities, higher scores on standardized testing, increased confidence and a more well behaved student in general. Private lessons enhance these characteristics which in-turn is making for a better music program and for better students! About 2/3 of our scholarships are named in memory or in honor of loved ones and are funded by private donations from alumni, staff and supporters. The remaining scholarships are funded by the Princeton Music Boosters from our general budget through a variety of fund raising activities. Approximately 70% of the District’s students are at or near the poverty level and receive free or reduced lunch assistance. Princeton Music Boosters supports all aspects of music, band, jazz, theater and choir in the Princeton City Schools. Any student currently enrolled in Princeton that is in the 6th grade or higher may apply for a scholarship. 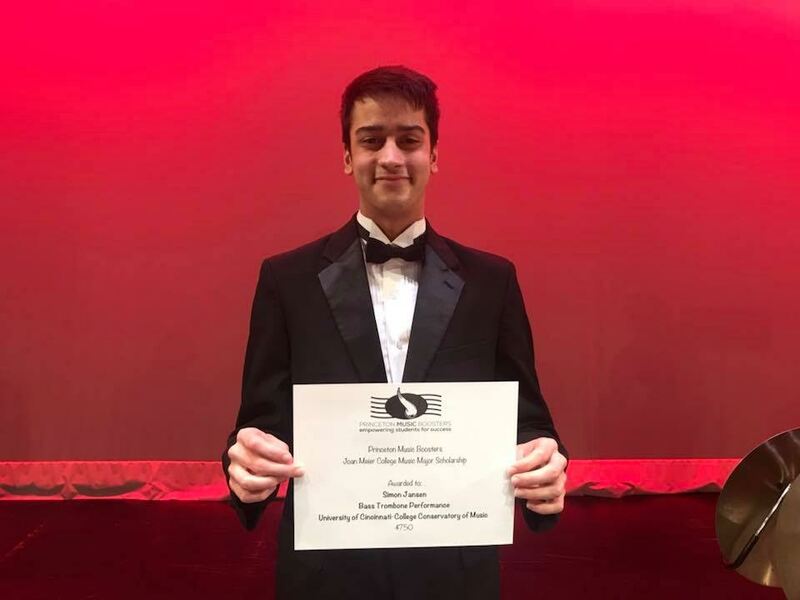 Scholarships are awarded on a variety of criteria and do not necessarily focus on grades or financial need, but more on passion, involvement and what the student brings to our music program. The private lesson scholarships are one of the Princeton Music Booster’s biggest priorities. 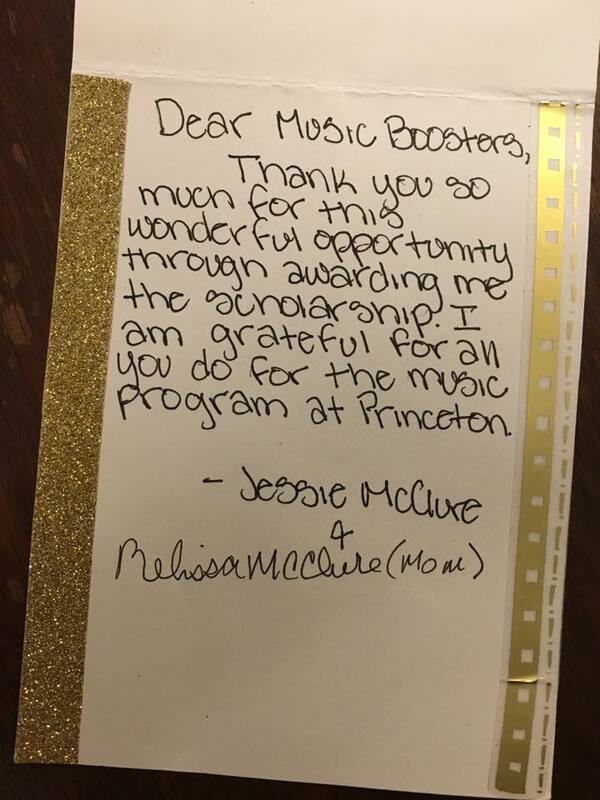 While we support Princeton’s music program in many ways, these subsidies are highly sought after as we receive about three times as many applications as we have scholarships! The Boosters are made up of a small, but dedicated group of parent and staff volunteers who work tirelessly to ensure Princeton’s long music traditions continue well into the future. 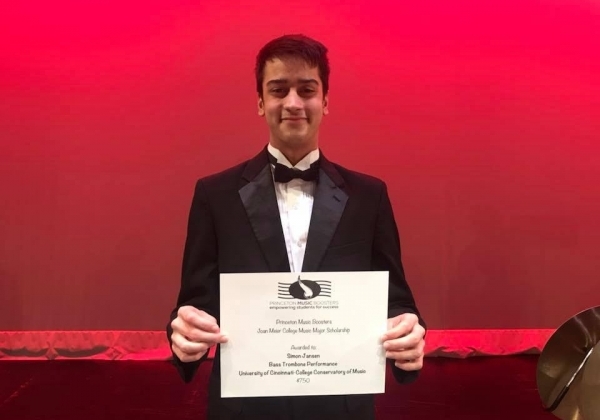 A sub-committee of the Princeton Music Boosters works specifically on making sure that we raise the appropriate funds and that information about the scholarships is distributed accordingly. Annually, a push is made to retain current contributors as well as to gain new donors. In accordance with the wishes of the donors, special mention is made of our donors and their scholarship via social media, printed programs as well as on stage prior to every performance a complete listing is shown to the audience. The scholarships are awarded near the end of the school, so work is on-going throughout much of the school year. In addition to raising the needed funds, volunteers ensure that the printed programs are updated as needed as well as making sure that the proper names appear in accordance with any special wishes from the donors. Likewise, they ensure that the “slides” shown on stage prior to every performance are correct and that information about making a new donation is readily available. Our members also man a table just outside our auditorium to not only fund raise but to explain about Princeton Music Boosters, answer questions, sign up new members and to accept any monetary donations that may come from the performance. Over the past 57 years, Princeton Music Boosters has continued to meet the needs of not only the Princeton Music Program, but help to empower our students to achieve what they never dreamed possible. We have been very fortunate that even during fiscal depressions (locally or nationally) we have stayed true to our mission and we have never wavered from awarding scholarships on an annual basis. We are proud to give away these 25 scholarships and hope to continue to increase that number to 30 by 2022. The budgetary process focuses on our sustainability in general but the scholarship fund is sacred and maintained at any cost. Whether it be uniforms, music or equipment, the one line item that will never be “adjusted” is scholarships. One of the many positives of this project is that giving away money is timeless! We instead get to concentrate on retaining our donors and seeking to obtain new donors. Whenever we go to public performances, host competitions or otherwise interact with the public we mention our amazing scholarship program, in hopes others will contribute to it. We also work hard on reaching our alumni and local businesses in order to get them involved and to create a legacy scholarship for their family or to get inexpensive advertisement. We have recently revamped the levels of donation and the amounts needed to reach those levels. These changes are still very new, but so far they have not caused any adverse effects. We have measured the performance of this project by sheer numbers. Since its inception, Princeton Music Boosters has helped Princeton’s music program by leaps and bounds. It’s in no small part to the exceptional students that make up our bands and choirs. Initially, we awarded just two scholarships. Today we receive upwards of 75 applications for the 25 available scholarships and we award $12,250 to our students! We have recently raised the scholarship donation amount from $400 to $500 in order to more adequately cover the cost of the lessons and to help the students attend these lessons for a longer period of time. Thankfully, since the increase, we have not seen any adverse effects. In fact, our 2017-2018 fund raising went so well, that we were able to award a second $750 scholarship for a total of 26 and $13,000 in awards! We anticipate this trend to continue and look forward to increasing the number of scholarships we award. There is no better feeling than handing a scholarship to a deserving student. We typically have the directors and staff that teach our students physically award the scholarship, but seeing the faces of all the winners is priceless. Our advice is simple; research any applicable rules/laws in your state, get complete buy-in (staff, administrators, students, parents, etc), raise the funds and then DO IT! It’s an exceptional avenue for alumni to stay in touch with their school and a great way to foster community & business involvement.